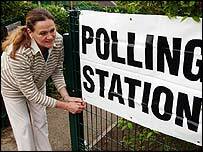 People could face fines if they fail to vote in British general elections, under plans outlined by Geoff Hoon. The Commons leader says a move towards compulsory voting is necessary to reinvigorate UK democracy. The proposals, which would give voters a "none of the above" choice, follow the 61% general election turnout. But the Conservatives' constitutional affairs spokesman, Oliver Heald, said: "There is little public support to make it a criminal offence not to vote." And Mr Hoon's fellow Labour minister James Plaskitt said the plans "amount to a cop out". Mr Hoon argued that people appreciated their MP's role in doing constituency work, but they had difficulty translating this to their role at a national level. During the election campaign he had met electors who claimed they would not be voting because they could not see the connection between their concerns about schools and hospitals and casting their ballot, he said. "We need to get people more engaged in political processes, to explain, to take through the argument from the local level," he told BBC2's the Daily Politics. "The idea of having a debate about compulsory voting is to get that engagement ... these are my ideas, my thoughts." Compulsory voting is already in place in countries including Australia, Austria, Belgium and Greece. Mr Hoon said British people could expect a "modest fine" for failing to vote, although he steered away from saying he wanted the scheme to be completely compulsory. "Rather like the introduction of seat belt legislation - if the idea goes out that it's something that is required of people, actually they adjust to it very quickly," he said. Asked if the ballot would include a box for "none of the above" politicians, Mr Hoon said: "I think that's absolutely vital. "People do in effect abstain by spoiling their ballot papers." While it is compulsory to be registered as a voter, it is estimated that more than 2.5m people had failed to do so, meaning turnout was even lower, said Mr Hoon. Mr Heald said: "There is little public support to make it a criminal offence not to vote. "At a time when anti-social behaviour and violent crime is out of control, the police have better things to do. The challenge for politicians is to excite electors with their ideas." Roger Knapman, leader of the UK Independence Party, said the move was "typical New Labour control freakery". "Democracy can only be built by consent, not by compulsion," he said. "If the government was truly interested in democratic participation, then it would do everything it could to show that it was relevant, responsive and most of all actually cared about and understood the lives of ordinary voters." Mr Plaskitt, a work and pensions minister, said: "I think it amounts to a cop-out for the political parties collectively. "If the voters are drifting away from participating then they are actually telling us something about the offer that all the political parties are making to the electorate and they are telling us they are not satisfied with that."